My mum found one of my old exercise books in the bottom of a drawer. It was made during my first year at school; a tattered collection of pages consisting of diary entries, writing assignments and a lot of crayoned drawings of people with bunches of sausages instead of hands. I leaf through it eagerly, looking for evidence of what it had been like to be seven years old; a long forgotten memory perhaps, some kind of message to my future self. Wednsday November 11: We had Pancakes for Tea ahd and mummy put some jam and on it. Friday November 20: This is my news I made a bookMarker with a cat onit. Short, and to the point. But what point? I turn the page. In the land where Jesus lived The houses had flat roofs The men rode on asss donkes donkeys and They had to get water from the well and they had bere feet. I notice that my teacher, Miss Johnson, has given me a gold star for this offering, along with a cheerful tick and the words ‘good work, Tania’ written in neat red pen. A little later, I come across the following: Thursday 7 January: daddy got a Rado. And underneath, a big drawing of yet another person with hands like sausages and something that only looks like a radio if you know it’s meant to be a radio, and not a mysterious object called a ‘Rado’. There’s a gold star on that page too. I begin to think that Miss Johnson hands out stars completely at random. On “Wennesday 3 March”, there’s a short story. I read it hopefully. Any signs of talent here? Any clues to future greatness? Once a pon a time There was an ant and one day he got lost and he made an ant hole and lived happeyly ever afterer. Thin, very thin. Although Miss Johnson apparently loves it, giving me a tick and another star – red this time. It isn’t until I get to the very last page of the exercise book that I find it: The message to my future self. The page contains the usual meager account of the day’s happenings. I’d watched television and eaten lunch (‘a sandwisch and an oronge”) and apparently that was it. But below the higgledy-piggledy writing there’s no cheerful praise. No star either. There isn’t even a tick. I suspect Miss Johnson has finally cracked. Her words have the ring of frustration, perhaps even of despair. 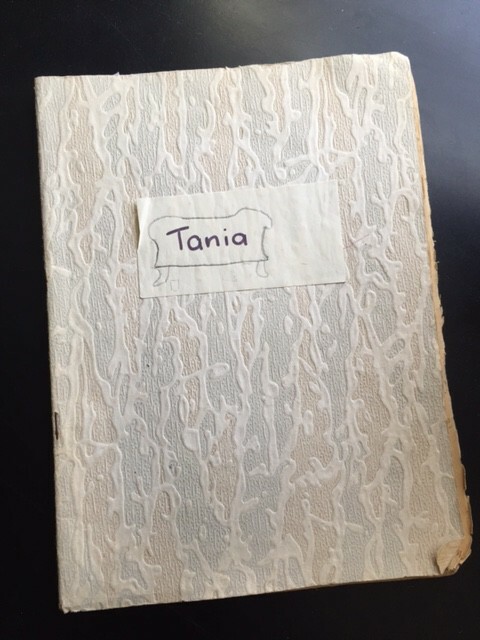 I think you can write more, Tania. I ought to make a copy of this line and stick it on the top of my computer to haunt me while I am playing my tenth game of Bejeweled Twist. A message to my future self all right. A lovely memory, Wendy Mishkin. Arn’t we amazing as kids. So good to look back to. My daughter has her school work books from her stay in South Africa in 1978/9 in Apartheid. All school books had to be covered in brown paper. My son said it was a “waste of time”. Mom did the covering. Find out about my books for children. Find out more about the work I do with schools and pupils. Contact me to find out about school visits, book clubs, and book store events.